Viper Vertex recently created and introduced the "Chimp Finder" with the debut of the Fragile Forest Exhibit at the St. Louis Zoo, May 2005. This exhibit is about conservation and creating a liaison between zoo visitors and live chimpanzees. 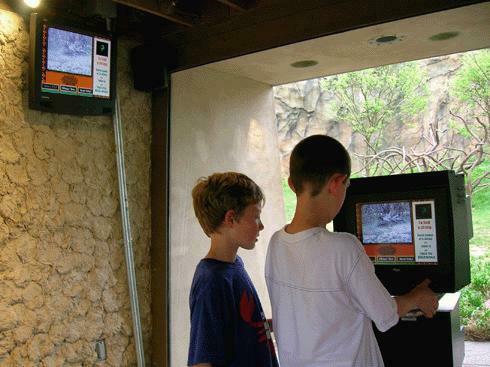 Designed as a new and innovative approach, the "Chimp Finder", a LIAISON system (Live Interactive Animal Identification System and Observation Network) provides the Zoo visitor a connection to the animals never previously experienced. "Chimp FInder" provides access to the animals, their individual and group habits as well as the activity of their daily lives. Through technology being designed and developed by Viper Vertex, visitors may select the animal(s) of interest, understand their interrelationships and then view information about them. The easy to use interactive touch display includes text, graphics, pictures and live video. The unique design of the system makes it easily accessible to all zoo visitors. Jody Gillerman (CEO of Viper Vertex) commented, "As part of the Chimp LIAISON Project we have had the privilege and opportunity to work with the staff and the chimps at the Saint Louis Zoo. Working with the Zoo Keepers and learning about the specific Chimps at the Saint Louis Zoo has reinforced our belief that Chimp Finder provides a wonderful personal connection between the zoo visitor and these unique and intelligent animals. Many species of the Great Apes are in serious danger of extinction and their numbers in the wild are staggeringly small. It is our hope that by helping zoo visitors connect personally with animals, in this case Chimpanzees through "Chimp Finder" at the St. Louis Zoo, the concern for conservation will become a priority. " Chimp Finder educates, informs and engages the visitor.